For other uses, see Battle of Saigon (disambiguation). The Fall of Saigon, or the Liberation of Saigon, was the capture of Saigon, the capital of South Vietnam, by the People's Army of Vietnam (PAVN) and the Viet Cong on 30 April 1975. The event marked the end of the Vietnam War and the start of a transition period to the formal reunification of Vietnam into the Socialist Republic of Vietnam. 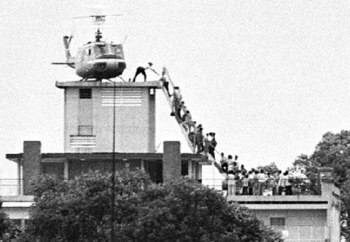 CIA agent helps evacuees up a ladder onto an Air America helicopter April 29, 1975, shortly before Saigon fell. The PAVN, under the command of General Văn Tiến Dũng, began their final attack on Saigon on April 29, 1975, with the Army of the Republic of Vietnam (ARVN) forces commanded by General Nguyễn Văn Toàn suffering a heavy artillery bombardment. This bombardment at the Tan Son Nhat International Airport killed the last two American servicemen killed in combat in Vietnam, Charles McMahon and Darwin Judge. By the afternoon of the next day, the PAVN had occupied the important points of the city and raised their flag over the South Vietnamese presidential palace. The city was renamed Hồ Chí Minh City, after the late North Vietnamese President Hồ Chí Minh. The capture of the city was preceded by Operation Frequent Wind, the evacuation of almost all the American civilian and military personnel in Saigon, along with tens of thousands of South Vietnamese civilians who had been associated with the southern regime. The evacuation was the largest helicopter evacuation in history. In addition to the flight of refugees, the end of the war and the institution of new rules by the communists contributed to a decline in the city's population. Various names have been applied to these events. The Vietnamese government officially calls it the "Day of liberating the South for national reunification" (Vietnamese: Giải phóng miền Nam, thống nhất đất nước) or "Liberation Day" (Ngày Giải Phóng), but the term "Fall of Saigon" is commonly used in Western accounts. It is called the "Ngày mất nước" (Day we Lost the Country), "Tháng Tư Đen" (Black April), "National Day of Shame" (Ngày Quốc Nhục) or "National Day of Resentment" (Ngày Quốc Hận). by many Overseas Vietnamese who were refugees from communism. The rapidity with which the South Vietnamese position collapsed in 1975 was surprising to most American and South Vietnamese observers, and probably to the North Vietnamese and their allies as well. For instance, a memo prepared by the Central Intelligence Agency (CIA) and U.S. Army Intelligence and published on March 5 indicated that South Vietnam could hold out through the current dry season—i.e., at least until 1976. These predictions proved to be grievously in error. Even as that memo was being released, General Dũng was preparing a major offensive in the Central Highlands of Vietnam, which began on 10 March and led to the capture of Buôn Ma Thuột. The ARVN began a disorderly and costly retreat, hoping to redeploy its forces and hold the southern part of South Vietnam, perhaps an enclave south of the 13th parallel. Supported by artillery and armor, the PAVN continued to march towards Saigon, capturing the major cities of northern South Vietnam at the end of March—Huế on the 25th and Đà Nẵng on the 28th. Along the way, disorderly South Vietnamese retreats and the flight of refugees—there were more than 300,000 in Đà Nẵng—damaged South Vietnamese prospects for a turnaround. After the loss of Đà Nẵng, those prospects had already been dismissed as nonexistent by American CIA officers in Vietnam, who believed that nothing short of B-52 strikes against Hanoi could possibly stop the North Vietnamese. By April 8, the North Vietnamese Politburo, which in March had recommended caution to Dũng, cabled him to demand "unremitting vigor in the attack all the way to the heart of Saigon." On April 14, they renamed the campaign the "Hồ Chí Minh campaign", after revolutionary leader Hồ Chí Minh, in hopes of wrapping it up before his birthday on May 19. Meanwhile, South Vietnam failed to garner any significant increase in military aid from the United States, snuffing out President Nguyễn Văn Thiệu’s hopes for renewed American support. On April 9, PAVN forces reached Xuân Lộc, the last line of defense before Saigon, where the ARVN 18th Division made a last stand and held the city through fierce fighting for 11 days. The PAVN finally overran Xuân Lộc on April 20 despite heavy losses, and on April 21 President Thiệu resigned in a tearful televised announcement in which he denounced the United States for failing to come to the aid of the South. The North Vietnamese front line was now just 26 miles (42 km) from downtown Saigon. The victory at Xuân Lộc, which had drawn many South Vietnamese troops away from the Mekong Delta area, opened the way for PAVN to encircle Saigon, and they soon did so, moving 100,000 troops in position around the city by April 27. With the ARVN having few defenders, the fate of the city was effectively sealed. The ARVN III Corps commander, General Toàn, had organized five centers of resistance to defend the city. These fronts were so connected as to form an arc enveloping the entire area west, north, and east of the capital. The Cu Chi front, to the northwest, was defended by the 25th Division; the Binh Duong front, to the north, was the responsibility of the 5th Division; the Bien Hoa front, to the northeast, was defended by the 18th Division; the Vung Tau and 15 Route front, to the southeast, were held by the 1st Airborne Brigade and one battalion of the 3rd Division; and the Long An front, for which the Capital Military District Command was responsible, was defended by elements of the re-formed 22nd Division. South Vietnamese defensive forces around Saigon totaled approximately 60,000 troops. However, as the exodus made it into Saigon, along with them were many ARVN soldiers, which swelled the "men under arms" in the city to over 250,000. These units were mostly battered and leaderless, which threw the city into further anarchy. The rapid PAVN advances of March and early April led to increased concern in Saigon that the city, which had been fairly peaceful throughout the war and whose people had endured relatively little suffering, was soon to come under direct attack. Many feared that once the communists took control of the city, a bloodbath of reprisals would take place. In 1968, PAVN and VC forces had occupied Huế for close to a month. After the communists were repelled, American and ARVN forces had found mass graves. A study indicated that the VC had targeted ARVN officers, Roman Catholics, intellectuals and businessmen, and other suspected counterrevolutionaries. More recently, eight Americans captured in Buôn Ma Thuột had vanished and reports of beheadings and other executions were filtering through from Huế and Đà Nẵng, mostly spurred on by government propaganda. Most Americans and citizens of other countries allied to the United States wanted to evacuate the city before it fell, and many South Vietnamese, especially those associated with the United States or South Vietnamese government, wanted to leave as well. As early as the end of March, some Americans were leaving the city, Flights out of Saigon, lightly booked under ordinary circumstances, were full. Throughout April the speed of the evacuation increased, as the Defense Attaché Office (DAO) began to fly out nonessential personnel. Many Americans attached to the DAO refused to leave without their Vietnamese friends and dependents, who included common-law wives and children. It was illegal for the DAO to move these people to American soil, and this initially slowed down the rate of departure, but eventually the DAO began illegally flying undocumented Vietnamese to Clark Air Base in the Philippines. On April 3, President Gerald Ford announced "Operation Babylift", which would evacuate about 2,000 orphans from the country. One of the Lockheed C-5 Galaxy planes involved in the operation crashed, killing 155 passengers and crew and seriously reducing the morale of the American staff. In addition to the over 2,500 orphans evacuated by Babylift, Operation New Life resulted in the evacuation of over 110,000 Vietnamese refugees. The final evacuation was Operation Frequent Wind which resulted in 7,000 people being evacuated from Saigon by helicopter. By this time the Ford administration had also begun planning a complete evacuation of the American presence. The planning was complicated by practical, legal, and strategic concerns. The administration was divided on how swift the evacuations should be. The Pentagon sought to evacuate as fast as possible, to avoid the risk of casualties or other accidents. The U.S. Ambassador to South Vietnam, Graham Martin, was technically the field commander for any evacuation since evacuations are part of the purview of the State Department. Martin drew the ire of many in the Pentagon by wishing to keep the evacuation process as quiet and orderly as possible. His desire for this was to prevent total chaos and to deflect the real possibility of South Vietnamese turning against Americans and to keep all-out bloodshed from occurring. Ford approved a plan between the extremes in which all but 1,250 Americans—few enough to be removed in a single day’s helicopter airlift—would be evacuated quickly; the remaining 1,250 would leave only when the airport was threatened. In between, as many Vietnamese refugees as possible would be flown out. American evacuation planning was set against other administration policies. Ford still hoped to gain additional military aid for South Vietnam. Throughout April, he attempted to get Congress behind a proposed appropriation of $722 million, which might allow for the reconstitution of some of the South Vietnamese forces that had been destroyed. Kissinger was opposed to a full-scale evacuation as long as the aid option remained on the table because the removal of American forces would signal a loss of faith in Thiệu and severely weaken him. There was also a concern in the administration over whether the use of military forces to support and carry out the evacuation was permitted under the newly passed War Powers Act. Eventually White House lawyers determined that the use of American forces to rescue citizens in an emergency was unlikely to run afoul of the law, but the legality of using military assets to withdraw refugees was unknown. While American citizens were generally assured of a simple way to leave the country just by showing up to an evacuation point, South Vietnamese who wanted to leave Saigon before it fell often resorted to independent arrangements. The under-the-table payments required to gain a passport and exit visa jumped sixfold, and the price of seagoing vessels tripled. Those who owned property in the city were often forced to sell it at a substantial loss or abandon it altogether; the asking price of one particularly impressive house was cut 75 percent within a two-week period. American visas were of enormous value, and Vietnamese seeking American sponsors posted advertisements in newspapers. One such ad read: "Seeking adoptive parents. Poor diligent students" followed by names, birthdates, and identity card numbers. As the North Vietnamese chipped away more and more at South Vietnam, internal opposition to President Thiệu continued to accumulate. For instance, in early April, the Senate unanimously voted through a call for new leadership, and some top military commanders were pressing for a coup. In response to this pressure, Thiệu made some changes to his cabinet, and Prime Minister Trần Thiện Khiêm resigned. This did little to reduce the opposition to Thiệu. On April 8 a South Vietnamese pilot and communist spy, Nguyễn Thành Trung, bombed the presidential palace and then flew to a PAVN-controlled airstrip; Thiệu was not hurt. Many in the American mission—Martin in particular—along with some key figures in Washington, believed that negotiations with the communists were still possible, especially if Saigon could stabilize the military situation. Ambassador Martin’s hope was that North Vietnam’s leaders would be willing to allow a "phased withdrawal" whereby a gradual departure might be achieved in order to allow helpful locals and all Americans to leave (along with full military withdrawal) over a period of months. Opinions were divided on whether any government headed by Thiệu could effect such a political solution. The Provisional Revolutionary Government’s foreign minister had, on April 2, indicated that the PRG might negotiate with a Saigon government that did not include Thiệu. Thus, even among Thiệu’s supporters, pressure was growing for his ouster. President Thiệu resigned on April 21. His remarks were particularly hard on the Americans, first for forcing South Vietnam to accede to the Paris Peace Accords, second for failing to support South Vietnam afterwards, and all the while asking South Vietnam "to do an impossible thing, like filling up the oceans with stones." The presidency was turned over to Vice President Trần Văn Hương. The view of the North Vietnamese government, broadcast by Radio Hanoi, was that the new regime was merely "another puppet regime." All times given are Saigon time. On April 27, Saigon was hit by PAVN rockets – the first in more than 40 months. With his overtures to the North rebuffed out of hand, Tran resigned on 28 April and was succeeded by General Duong Van Minh. Minh took over a regime that was by this time in a state of utter collapse. However, he had longstanding ties with the Communists, and it was hoped he could negotiate a ceasefire. But Hanoi was in no mood to negotiate. On 28 April PAVN forces fought their way into the outskirts of the city. At the Newport Bridge (Cầu Tân Cảng), about five kilometres (three miles) from the city centre, the VC seized the Thảo Điền area at the eastern end of the bridge and attempted to seize the bridge but were repulsed by the ARVN 12th Airborne Battalion. As Bien Hoa was falling, General Toan fled to Saigon, informing the government that most of the top ARVN leadership had virtually resigned themselves to defeat. At 06:00 on April 29, General Dung was ordered by the Politburo to "strike with the greatest determination straight into the enemy's final lair." After one day of bombardment and general offensive, the PAVN were ready to make their final push into the city. South Vietnamese refugees arrive on a U.S. Navy vessel during Operation Frequent Wind. Before daybreak on April 29, Tan Son Nhat Airport was hit by rockets and heavy artillery. In the initial shelling, C-130E, 72-1297, c/n 4519, of the 314th Tactical Airlift Wing, and flown by a crew from the 374th Tactical Airlift Wing out of Clark Air Base, Philippines, was destroyed by a rocket while taxiing to pick up evacuees. The crew evacuated the burning aircraft on the taxiway and departed the airfield on another C-130 that had previously landed. That C-130, the last to depart South Vietnam is now the gate guardian at the Air Force Base in Jacksonville, Arkansas. The continuing rocket fire and debris on the runways caused General Homer D. Smith, the U.S. defense attaché in Saigon, to advise Ambassador Martin that the runways were unfit for use and that the emergency evacuation of Saigon would need to be completed by helicopter. Originally, Ambassador Martin had intended to effect the evacuation by use of fixed-wing aircraft from the base. This plan was altered at a critical time when a South Vietnamese pilot decided to defect, and jettisoned his ordnance along the only runways still in use (which had not yet been destroyed by shelling). Under pressure from Kissinger, Martin forced Marine guards to take him to Tan Son Nhat in the midst of continued shelling, so he might personally ascertain the situation. After seeing that fixed-wing departures were not an option (a decision Martin did not want to make without firsthand responsibility in case the helicopter lift failed), Martin gave the green light for the helicopter evacuation to begin in earnest. Reports came in from the outskirts of the city that the PAVN were closing in. At 10:48 a.m., Martin relayed to Kissinger his desire to activate "the FREQUENT WIND" evacuation plan; Kissinger gave the order three minutes later. The American radio station began regular play of Irving Berlin's "White Christmas", the signal for American personnel to move immediately to the evacuation points. A U.S. Marine provides security as American helicopters land at the DAO compound. Under this plan, CH-53 and CH-46 helicopters were used to evacuate Americans and friendly Vietnamese to ships, including the Seventh Fleet, in the South China Sea. The main evacuation point was the DAO Compound at Tan Son Nhat; buses moved through the city picking up passengers and driving them out to the airport, with the first buses arriving at Tan Son Nhat shortly after noon. The first CH-53 landed at the DAO compound in the afternoon, and by the evening, 395 Americans and more than 4,000 Vietnamese had been evacuated. By 23:00 the U.S. Marines who were providing security were withdrawing and arranging the demolition of the DAO office, American equipment, files, and cash. Air America UH-1s also participated in the evacuation. 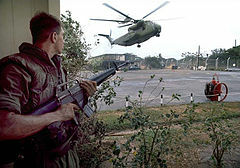 The original evacuation plans had not called for a large-scale helicopter operation at the United States Embassy, Saigon. Helicopters and buses were to shuttle people from the embassy to the DAO Compound. However, in the course of the evacuation it turned out that a few thousand people were stranded at the embassy, including many Vietnamese. Additional Vietnamese civilians gathered outside the embassy and scaled the walls, hoping to claim refugee status. Thunderstorms increased the difficulty of helicopter operations. Nevertheless, the evacuation from the embassy continued more or less unbroken throughout the evening and night. At 03:45 on the morning of April 30, Kissinger and Ford ordered Martin to evacuate only Americans from that point forward. Reluctantly, Martin announced that only Americans were to be flown out, due to worries that the North Vietnamese would soon take the city and the Ford administration's desire to announce the completion of the American evacuation. Ambassador Martin was ordered by President Ford to board the evacuation helicopter. The call sign of that helicopter was "Lady Ace 09", and the pilot carried direct orders from President Ford for Ambassador Martin to be on board. The pilot, Gerry Berry, had the orders written in grease-pencil on his kneepads. Ambassador Martin's wife, Dorothy, had already been evacuated by previous flights, and left behind her personal suitcase so a South Vietnamese woman might be able to squeeze on board with her. Model of U.S. embassy in Saigon. The rooftop staircase that can be seen in the model is on permanent display at the Gerald R. Ford Museum in Grand Rapids, Michigan. "Lady Ace 09" from HMM-165 and piloted by Berry, took off at 04:58 – had Martin refused to leave, the Marines had a reserve order to arrest him and carry him away to ensure his safety. The embassy evacuation had flown out 978 Americans and about 1,100 Vietnamese. The Marines who had been securing the embassy followed at dawn, with the last aircraft leaving at 07:53. 420 Vietnamese and South Koreans were left behind in the embassy compound, with an additional crowd gathered outside the walls. The Americans and the refugees they flew out were generally allowed to leave without intervention from either the North or South Vietnamese. Pilots of helicopters heading to Tan Son Nhat were aware that PAVN anti-aircraft guns were tracking them, but they refrained from firing. The Hanoi leadership, reckoning that completion of the evacuation would lessen the risk of American intervention, had instructed Dũng not to target the airlift itself. Meanwhile, members of the police in Saigon had been promised evacuation in exchange for protecting the American evacuation buses and control of the crowds in the city during the evacuation. Although this was the end of the American military operation, Vietnamese continued to leave the country by boat and, where possible, by aircraft. Republic of Vietnam Air Force (RVNAF) pilots who had access to helicopters flew them offshore to the American fleet, where they were able to land. Many RVNAF helicopters were dumped into the ocean to make room on the decks for more aircraft. RVNAF fighters and other planes also sought refuge in Thailand while two O-1s landed on an American carrier, USS Midway (CV-41). Ambassador Martin was flown out to the USS Blue Ridge, where he pleaded for helicopters to return to the embassy compound to pick up the few hundred remaining hopefuls waiting to be evacuated. Although his pleas were overruled by President Ford, Martin was able to convince the Seventh Fleet to remain on station for several days so any locals who could make their way to sea via boat or aircraft might be rescued by the waiting Americans. Many Vietnamese nationals who were evacuated were allowed to enter the United States under the Indochina Migration and Refugee Assistance Act. Decades later, when the U.S. government reestablished diplomatic relations with Vietnam, the former embassy building was returned to the United States. The historic staircase that led to the rooftop helicopter pad was salvaged and is on permanent display at the Gerald R. Ford Museum in Grand Rapids, Michigan. In the early hours of April 30, Dung received orders from the Politburo to attack. He then ordered his field commanders to advance directly to key facilities and strategic points in the city. The first PAVN unit to enter the city was the 324th Division. By daybreak, it was obvious that the ARVN's position was untenable. On the morning of 30 April PAVN sappers attempted to seize the Newport Bridge but were repulsed by the ARVN Airborne. At 09:00 the PAVN tank column approached the bridge and came under fire from ARVN tanks which destroyed the lead T-54, killing the PAVN Battalion commander. The ARVN 3rd Task Force, 81st Ranger Group commanded by Maj. Pham Chau Tai defended Tan Son Nhut and they were joined by the remnants of the Loi Ho unit. At 07:15 on 30 April the PAVN 24th Regiment approached the Bay Hien intersection (10°47′35″N 106°39′11″E﻿ / ﻿10.793°N 106.653°E﻿ / 10.793; 106.653) 1.5 km from the main gate of Tan Son Nhut Air Base. The lead T-54 was hit by M67 recoilless rifle and then the next T-54 was hit by a shell from an M48 tank. The PAVN infantry moved forward and engaged the ARVN in house to house fighting forcing them to withdraw to the base by 08:45. The PAVN then sent 3 tanks and an infantry battalion to assault the main gate and they were met by intensive anti-tank and machine gun fire knocking out the 3 tanks and killing at least 20 PAVN soldiers. The PAVN tried to bring forward an 85mm antiaircraft gun but the ARVN knocked it out before it could start firing. The PAVN 10th Division ordered 8 more tanks and another infantry battalion to join the attack, but as they approached the Bay Hien intersection they were hit by an airstrike from RVNAF jets operating from Binh Thuy Air Base which destroyed 2 T-54s. The 6 surviving tanks arrived at the main gate at 10:00 and began their attack, with 2 being knocked out by antitank fire in front of the gate and another destroyed as it attempted a flanking manoeuvre. At 10:24, Minh announced an unconditional surrender. He ordered all ARVN troops "to cease hostilities in calm and to stay where they are", while inviting the Provisional Revolutionary Government to engage in "a ceremony of orderly transfer of power so as to avoid any unnecessary bloodshed in the population." At Newport Bridge the ARVN and PAVN continued to exchange tank and artillery fire until the ARVN commander received President Minh's capitulation order over the radio. While the bridge was rigged with approximately 4000lbs of demolition charges, the ARVN stood down and at 10:30 the PAVN column crossed the bridge. PAVN T-54/55 tanks under the command of Colonel Bùi Tín burst through the gates of the Independence Palace around noon. They found Minh and 30 of his advisors sitting around the big oval table in the cabinet room, waiting for them. As they entered, Minh said "The revolution is here. You are here." He added, "We have been waiting for you so that we could turn over the government." Tín curtly replied, "There is no question of your transferring power. Your power has crumbled. You cannot give up what you do not have." Later that afternoon, Minh went on the radio for the final time and announced, "I declare [that] the Saigon government is completely dissolved at all levels." The Vietnam War was over. Dương Văn Minh, the last president of Vietnam is escorted away by PAVN soldiers. The communists renamed the city after Ho Chi Minh, former President of North Vietnam, although this name was not frequently used outside official business. Order was slowly restored, although the by-then-deserted U.S. Embassy was looted, along with many other businesses. Communications between the outside world and Saigon were cut. The Communist party machinery in South Vietnam was weakened, owing in part to the Phoenix Program, so the PAVN was responsible for maintaining order and General Trần Văn Trà, Dung's administrative deputy, was placed in charge of the city. The new authorities held a victory rally on May 7. One objective of the Communist Party of Vietnam was to reduce the population of Saigon, which had become swollen with an influx of people during the war and was now overcrowded with high unemployment. "Re-education classes" for former soldiers in the ARVN indicated that in order to regain full standing in society they would need to move from the city and take up farming. Handouts of rice to the poor, while forthcoming, were tied to pledges to leave Saigon for the countryside. According to the Vietnamese government, within two years of the capture of the city one million people had left Saigon, and the state had a target of 500,000 further departures. Following the end of the war, according to official and non-official estimates, between 200,000 and 300,000 South Vietnamese were sent to re-education camps, where many endured torture, starvation, and disease while being forced to perform hard labor. April 30 is a public holiday in Vietnam, known as Reunification Day (though the official reunification of the nation actually occurred on 2 July 1976) or Liberation Day (Ngày Giải Phóng). Whether the evacuation had been successful or not has been questioned following the end of the war. Operation Frequent Wind was generally assessed as an impressive achievement – Văn Tiến Dũng stated this in his memoirs and The New York Times described it as being carried out with "efficiency and bravery". On the other hand, the airlift was also criticized for being too slow and hesitant, and that it was inadequate in removing Vietnamese civilians and soldiers connected with the American presence. The U.S. State Department estimated that the Vietnamese employees of the U.S. Embassy in South Vietnam, past and present, and their families totaled 90,000 people. In his testimony to Congress, Ambassador Martin asserted that 22,294 such people were evacuated by the end of April. In 1977, National Review alleged that some 30,000 South Vietnamese had been systematically killed using a list of CIA informants left behind by the US embassy. April 30 is celebrated as a public holiday in Vietnam as Liberation Day or Reunification Day. Along with International Workers' Day on May 1, most people take the day off work and there are public celebrations. Among overseas Vietnamese the week of April 30 is referred to as "Black April" and is used as a time of lamentation for the fall of Saigon and South Vietnam as a whole. The event is approached from different perspectives, with arguments that the date was a sign of American abandonment, or as a memorial for the war and for the mass exodus as a whole. ^ Los Angeles Times (29 April 2015). "Is it Liberation Day or Defeat Day in Saigon?". latimes.com. Archived from the original on 2016-02-16. Retrieved 13 February 2016. ^ "Giai Phong! The Fall and Liberation of Saigon". Foreign Affairs. Archived from the original on 2016-02-16. Retrieved 13 February 2016. ^ "The U.S. and Vietnam: 40 Years After the Fall of Saigon". Archived from the original on 2018-11-04. Retrieved 2018-11-03. .
^ Dunham and Quinlan, 202. ^ Desbarats, Jacqueline. "Repression in the Socialist Republic of Vietnam: Executions and Population Relocation", from The Vietnam Debate (1990) by John Morton Moore. ^ "Black April". Los Angeles Times. Archived from the original on 2013-12-21. Retrieved December 7, 2013. ^ a b "Black April". UNAVSA Knowledge. Archived from the original on 2013-12-10. Retrieved December 7, 2013. ^ "Black April". VNAFMAMN. Archived from the original on 2013-11-10. Retrieved December 7, 2013. ^ Secretary of State. "Assembly Concurrent Resolution No. 220 Chapter 74 Relative to Black April Memorial Week". Legislative Counsel's Digest. California Legislative Information. Archived from the original on 2013-12-12. Retrieved December 7, 2013. ^ Kurhi, Eric. "Black April ceremony honors Vietnam War soldiers in San Jose". San Jose Mercury News. Archived from the original on 2013-12-11. Retrieved December 7, 2013. ^ Bharath, Deepa (April 29, 2011). "O.C. Black April events commemorate fall of Saigon". Orange County Register. Archived from the original on 2013-12-12. Retrieved December 7, 2013. ^ Bharath, Deepa (April 25, 2008). "Black April events commemorate fall of Saigon". Orange County Register. Archived from the original on May 18, 2009. Retrieved May 28, 2009. ^ "Audio Slideshow: Black April". Los Angeles Times. Archived from the original on 2009-05-04. Retrieved May 28, 2009. ^ Trần, Mỹ-Thuận (April 30, 2009). "Orange County's Vietnamese immigrants reflect on historic moment". Los Angeles Times. Archived from the original on 2009-05-03. Retrieved May 28, 2009. ^ Dzũng, Đỗ (April 30, 2009). "Tưởng niệm Tháng Tư Đen ở Quận Cam". Báo Người Việt. Archived from the original on May 2, 2009. Retrieved May 28, 2009. ^ NEWS.BBC.co.uk Archived 2010-11-22 at the Wayback Machine BBC on this Day | 21 | 1975: Vietnam's President Thieu resigns. ^ a b c Dawson, xv. ^ "Saigon Hears the Fighting at Its Edge". The New York Times. 28 April 1975. Retrieved 25 September 2016. ^ a b c d e f g Tobin, Thomas (1978). USAF Southeast Asia Monograph Series Volume IV Monograph 6: Last Flight from Saigon. US Government Printing Office. p. 70. ISBN 9781410205711. ^ a b Dunham, George R (1990). U.S. Marines in Vietnam: The Bitter End, 1973–1975 (Marine Corps Vietnam Operational Historical Series). History and Museums Division Headquarters, U.S. Marine Corps. p. 182. ISBN 978016026455-9. ^ Schudel, Matt (31 March 2014). "Thomas Polgar, CIA official during the fall of Saigon, dies". The Washington Post. Archived from the original on 2016-03-09. Retrieved 24 November 2016. ^ Accounts of Operation Frequent Wind can be found in Spencer (s.v. "FREQUENT WIND, Operation"), Todd (346-387), and Isaacs. ^ Esper, George, "Copters Ending Vietnam Era", The Washington Star, Washington, D.C., Tuesday April 29, 1975, page A-1. ^ a b Tanner, 314. ^ a b Snepp, 568. ^ a b Veith, George (2012). Black April The Fall of South Vietnam 1973-75. Encounter Books. pp. 488–9. ISBN 9781594035722. ^ Associated Press, "Minh Surrenders, Vietcong In Saigon". ^ a b c Oliver, Myrna (8 August 2001). "Duong Van Minh; Last President of S. Vietnam". Los Angeles Times. Archived from the original on 2012-10-04. Retrieved 11 October 2009. ^ Veith, George (2012). Black April The Fall of South Vietnam 1973-75. Encounter Books. p. 492. ISBN 9781594035722. ^ Butterfield, Fox (8 August 2001). "Duong Van Minh, 85, Saigon Plotter, Dies". The New York Times. Archived from the original on 2012-11-27. Retrieved 29 November 2012. ^ a b Dawson, 351. ^ Porter, Gareth; Roberts, James (1988-01-01). Desbarats, Jacqueline; Jackson, Karl D. (eds.). "Creating a Bloodbath by Statistical Manipulation". Pacific Affairs. 61 (2): 303–310. doi:10.2307/2759306. JSTOR 2759306. ^ Metzner, Edward P. (2001-01-01). Reeducation in Postwar Vietnam: Personal Postscripts to Peace. Texas A&M University Press. pp. xiii. ISBN 9781585441297. ^ Sagan, Ginetta; Denney, Stephen (October–November 1982). "Re-education in Unliberated Vietnam: Loneliness, Suffering and Death". The Indochina Newsletter. Archived from the original on 2016-09-14. Retrieved 2016-09-01. ^ New York Times, "The Americans Depart"
^ Le Thi Anh, "The New Vietnam", National Review, April 29, 1977. "According to Frank Snepp, a CIA analyst who served in Saigon, the American Embassy was not able to destroy its top-secret files during the frantic evacuation, and among the information that fell into Communist hands was a list of 30,000 Vietnamese who had worked in the Phoenix Program, a U.S.-sponsored operation responsible for the elimination of thousands of Communist agents. A full report on the massacre of those 30,000 Phoenix cadres is said to have reached the desk of the French ambassador to Saigon by late 1975; he communicated it to Washington, where nothing was done with it." ^ "Black April events commemorate fall of Saigon". The Orange County Register. Archived from the original on 18 May 2009. Retrieved 13 February 2016. ^ "Black April 30th 1975". vnafmamn.com. Archived from the original on 2016-03-03. Retrieved 13 February 2016. Adams, E. G. "The Beginning of the End". Archived from the original on 2011-07-20. Brown, Weldon (1976). The Last Chopper: The Dénouement of the American Role in Vietnam, 1963–1975. Kennikat Press. Butler, David (1985). The Fall of Saigon. New York: Simon and Schuster. ISBN 0671466755. Butterfield, Fox (April 2, 1975). "Many Americans Quit Vietnam; U.S. Denies Evacuation Orders". The New York Times: 1. Dunham, George R.; Quinlan, David A. (1990). U.S. Marines in Vietnam: The Bitter End, 1973–1975. History and Museums Division, Headquarters, U.S. Marine Corps. Engelmann, Larry (1990). Tears before the Rain: An Oral History of the Fall of South Vietnam. Oxford University Press. ISBN 978-0-19-505386-9. Isaacs, Arnold (1983). Without Honor: Defeat in Vietnam and Cambodia. The Johns Hopkins University Press. ISBN 0801861071. Kissinger, Henry (2003). Ending the Vietnam War: A History of America's Involvement in and Extrication from the Vietnam War. Simon & Schuster. ISBN 0-7432-1532-X. Văn Tiến Dũng. Our Great Spring Victory: An Account of the Liberation of South Vietnam. Monthly Review Press, 1977. "Saigon's Finale" - The New York Times. "1975: Saigon surrenders" - BBC News.